Whip your hair back away from your face with a messy bun. Whether the weather is warm or you are in need of a quick hair style, all you need is a single ponytail holder and hair that is long enough for a ponytail. Turn your tresses into a messy bun within minutes. Place the bun on top of your head and off of your neck line before an exercise session. Leave the bun low on either side of your head for an evening event or formal occasion. 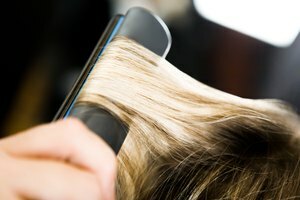 Brush your hair thoroughly to remove knots or tangles. Spray the brush with shine serum spray, if desired, and apply the spray over the hair by brushing over the outer layer of your hair. Gather all of your hair back into one hand. Pull the mass of hair wherever you want to place the messy bun, such as at the top of your head or at the base of your neck next to your hairline. Hold the bundle of hair close to your head at the hairline, and begin twisting the hair in one direction. Continue twisting the hair until it begins to wind around itself at the hairline to form a bun. Stretch a ponytail holder out with your other hand to form a circle large enough to wrap it around the entire bun. Pull the ponytail holder over the bun. Twist the holder around to form a second circle and wrap this around the bun again, ensuring that the ends of the bun are held tightly beneath the ponytail holder. Pull pieces of hair out of the bun, so that some hairs come out completely while other pieces of hair form loose loops. Pick out a few pieces of hair near your crown and pull these out of the bun so they fall around your face. Spray the finished messy bun with hairspray, if desired, in order to hold the falling hairs into place and maintain the hairstyle as it is. Apply hairspray if you cannot redo your hairstyle as needed, such as for a wedding or formal event, in order to hold the messy bun in place and prevent more pieces of hair from falling down. You can add glimmer to the messy bun by spraying hair glitter over the hair style.